Place Value Practice Based on Common Core For Christmas! - Fern Smith's Classroom Ideas! Place Value Practice Based on Common Core For Christmas! 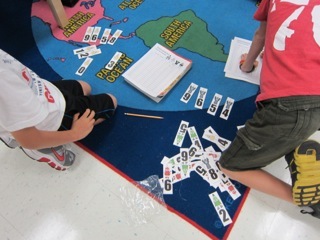 Christmas Bears Place Value Race Game! So I created a place value game during Halloween that can be differentiated for high, middle and low. It can be played with just the "Tens" version or the "Hundreds" version. 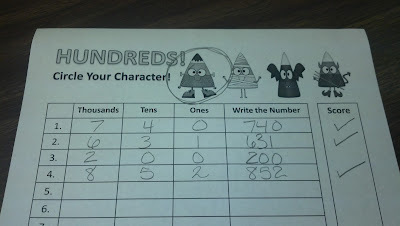 Meanwhile, your high group students can be playing the same game, but with the "Thousands" version. It is also an excellent tool to play in your small group and gather data for your RtI documentation. Observe a student and you will know instantly if they can problem solve to created the highest number when given three cards, 3, 6 and 8 for example. If they don't make it into 863, there's a problem! I now have a Christmas Version for you! playing the game and sent it to me. If you take pictures of your class, I would love to see them! That looks adorable! I love the little bears. Hey stop by my blog, I'm having a giveaway.